You can play The Old Republic in Australia as long as you're willing to put up with the laggy side of the force. While Australia isn't a launch territory for Star Wars: The Old Republic, BioWare says that it has no plans to prevent any Australians who decide to import the game from playing it. 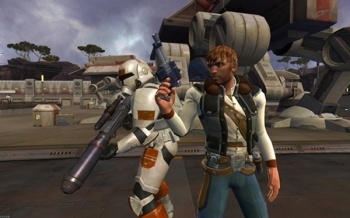 Posting on the Old Republic community forums, senior online community manager Stephen Reid said that the only problems that Australian games would have would be some latency issues, and regional locking or IP blocking was not on the cards. Additionally, it appears that Australian gamers will be able to redeem any pre-order bonuses they might be entitled to - including early access to the game - just like players in launch territories. Of course, while BioWare isn't preventing people from playing the game, Australian gamers are still not going to be in for an optimal game experience until the game officially launches in the country. Reid's post did suggest that local servers would be coming to the Oceania region, although there was no mention of exactly when that might be. BioWare is yet to reveal the release date for Star Wars: The Old Republic, although the game is expected before the end of the year.